Having a healthy mouth and a bright, white smile starts with daily choices. Making sure that twice daily brushing and flossing is a regular part of your routine is essential. It is also important to teach these habits to your children, so they can have a healthy mouth as they grow. Of course, it is important to come into the office for regular check-ups and cleanings, but it is during the day to day routines that great oral health and beautiful smiles are really made. We recommend brushing and flossing your teeth twice a day. 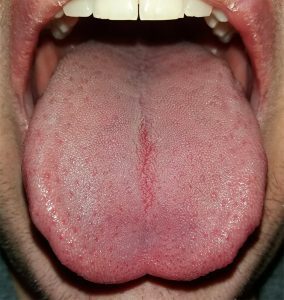 Along with this, and something that many people don’t realize, is that you should brush your tongue twice daily, too. Making this a habit will keep your mouth healthier, reduce bad breath, and contribute to a cosmetic appearance with brighter teeth. Brushing your tongue is especially important to reducing bad breath and reducing bacteria in your mouth. The tongue plays host to many different kinds of bacteria. The bacteria can hide in the textured areas of the tongue and make a home there. When you brush your tongue, you can get rid of a large portion of this bacteria. This helps you have better breath and is a benefit to overall oral health. Rinsing with water or mouthwash is not enough to remove the bacteria. This kind of bacteria creates a film on the tongue that needs to be gently scraped off. If you are worried about bad breath, regularly brushing your tongue can improve the breath of most people. You don’t have to do much to add tongue brushing to your oral hygiene routine. It only takes a few extra seconds. Just brush back and forth and then side to side and rinse your mouth out with water. Also, you don’t have to brush too hard, just a gentle yet steady brushing technique will work great. Newman Family Dentistry offers family dentistry in Carmel, and Indianapolis. With us, you can trust you are getting high quality care in a friendly, positive environment. We provide a wide range of family dentistry services including x-rays, check-ups, fillings, and more. Our staff are all committed to giving you the best experience possible from the moment you walk in the door. Our dentists, dental hygienists, dental assistants, and all of our staff will listen to your concerns and address them. This also means we are concerned with helping you make smart, educated choices related to your oral hygiene. Call Newman Family Dentistry to find oure more helpful tips or to schedule an appointment at our office. Our friendly front desk staff will be happy to help.